I am forever obsessed about packing lunches. It seems there are lots of great products available now to pack a waste-free lunch, for kids and adults. One clever company called Kids Konserve has made it even easier. They found all the great elements needed to pack an eco-lunch, and put them all together into coordinated sets. 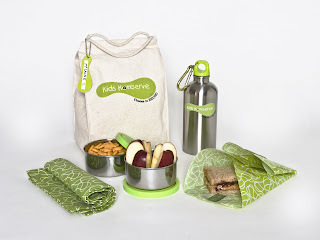 Their website offers all the stylish, eco pieces your lunch could need in one convenient place. If you haven't perfected your lunch system yet or need a gift for someone, take a look here. i have the containers and like them. I got the oots lunch box for madden this xmas and really like their containers. I love the Kids Konserve stainless steel containers! Also, the food kozy is so versatile: wrap a sandwich, cheese slices and salami, tortilla sandwiches, or use in the refrig to wrap up leftover cheeses. I have been very happy with my new products. Thank you for featuring Kids Konserve.